STUTTGART (DE) - Coperion K-Tron Niederlenz, Switzerland, has supplied two feeding systems comprising five feeders each to Pfizer Manufacturing Deutschland GmbH in Freiburg, Germany, as part of a project to expand their existing plant and switch to continuous production. The Coperion K-Tron feeding systems are a key part of the new continuous production concept. 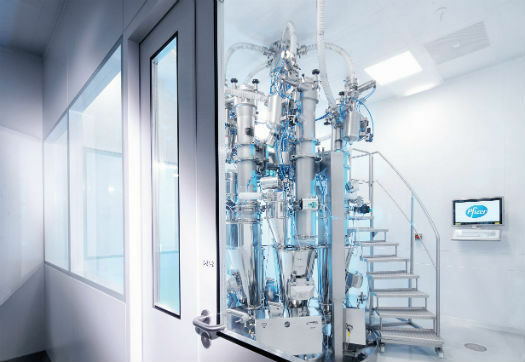 At Pfizer, the compact arrangement of pharmaceutical feeders supplied by Coperion K-Tron accurately deliver ingredients into the continuous mixing process, thereby guaranteeing consistent and very high quality end products. In converting their facility in Freiburg to continuous production, Pfizer is increasing the flexibility and also sustainability of the plant by implementing various environmentally friendly measures. This makes the Pfizer plant in Freiburg one of the most modern pharmaceutical production facilities in the world – not to mention one of the most highly automated. In the continuous system, individual production steps – i.e. supplying, feeding and mixing – are linked together in the process without interruption and optimally tuned to one another. Pfizer decided to draw from Coperion K-Tron’s many years of experience and expertise in feeding technology. The scope of supply comprised two complete feeding systems, each consisting of two high-accuracy K-PH-ML-D5-KT20 gravimetric twin screw feeders with ActiFlow™ and P10 Jetfilters, in addition to three K-PH-ML-D5-KT35 gravimetric twin screw feeders with ActiFlow and P10 Jetfilters. Coperion K-Tron digital SFT weighbridges continuously measure the weight of each feeder, allowing the KCM feeder control modules to monitor and regulate the feed rates in a highly accurate manner. The Coperion K-Tron pharmaceutical feeding systems with patented SFT technology fulfill the stringent requirements of the pharmaceutical industry. One vital requirement for the feeding systems was to precisely feed the various ingredients, delivering them into the process as required by the formulation of the medication in question. The highly accurate, patented digital weighing technology and the controller’s quick reaction time allow smaller feed hoppers to be used. A benefit of the smaller Coperion K-Tron feed hoppers used in the system is that the surface area which needs cleaning is also smaller in comparison to larger feed hoppers, thereby reducing the cleaning effort involved. One major challenge when designing the feeding systems was the requirement to position the five feeding devices in a circle within a tight installation space and yet still ensure ease of accessibility and maintenance. With many years of experience in the pharmaceutical industry and comprehensive expertise in the field of feeding solutions, Coperion K-Tron was able to make the customer’s requirements a reality and supply the desired feeding systems for continuous production. Since the futuristic plant in Freiburg was opened on May 23, 2017 and the existing batch production was converted to continuous production, Pfizer is now operating with a new, fully automated production process.